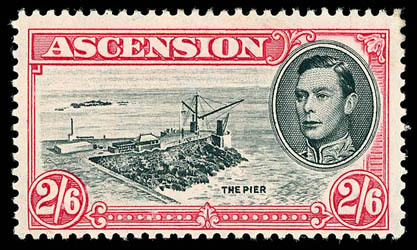 Ascension, 1944, King George VI Pictorial, 2s6d black & deep carmine, perf 13, cut mast and railings, o.g., lightly hinged, bright and P.O. fresh, F.-V.F., a rare design flaw plate variety. Scott No. 47 var. SG No. 45cb £2,250 ($2,770). 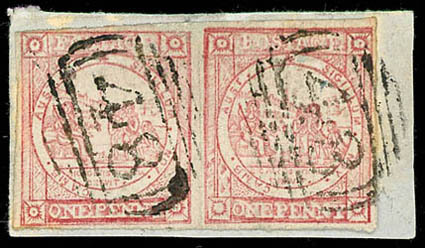 New South Wales, 1850, Sydney View, 1d Pairs, two pairs; horizontal pair of plate I pale red (S.G. 5) on small piece canceled "48" of Tarcutta, and vertical pair of plate II early impression, deep color (S.G. 7) canceled Sydney bars, F.-V.F. Scott No. 1b, 2. SG No. 5, 7 £1,700 ($2,090). 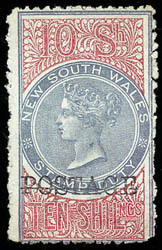 New South Wales, 1886, Queen Victoria, 10s lilac & claret, overprinted "POSTAGE" in black, perf 12, without gum, strong colors, cert. states colors slightly faded which we feel is erroneous, F.-V.F. ; with 2017 A.P.S. certificate. Scott No. 73. SG No. 239a £1,600 ($1,970). 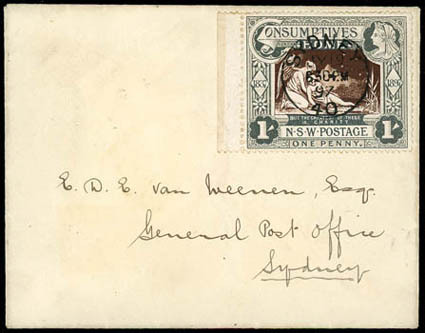 New South Wales, 1897 Consumptives Home complete, each with sheet margin and cancelled by "Sydney, JY 19 '97" cds on matched pair of small local covers, a Very Fine pair. SG No. 280/1. Scott No. B1-B2 Estimate $500 - 750. 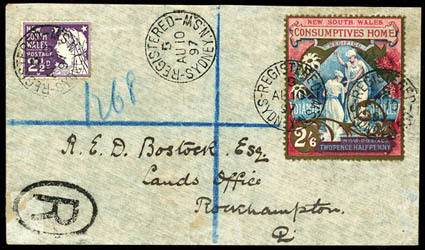 New South Wales, 1897, Consumptives Home, 2½d (2s6d) gold, carmine & blue, used with 2½d purple, each tied by strikes of "Registered, Sydney N.S.W., AU 10 98" cds on gray registered cover to Rockhampton, Queensland, reverse with Aug. 12th arrival cds, Very Fine and rare use. SG No. 281. Scott No. 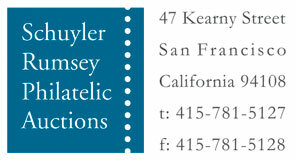 B2 Estimate $750 - 1,000. 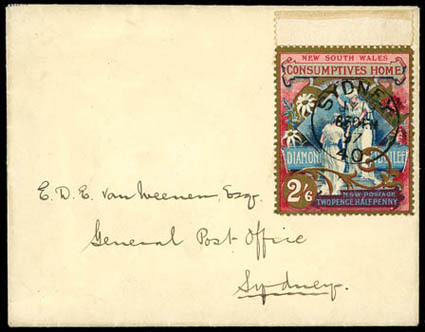 New South Wales, 1897, Consumptives Home, 2½d (2s6d) gold, carmine & blue, horizontal pair, tied by two strikes of "Registered, Sydney N.S.W., JU 30 97" cds on legal-size cover to Melbourne, reverse with July 1st arrival cds, Very Fine. SG No. 281. 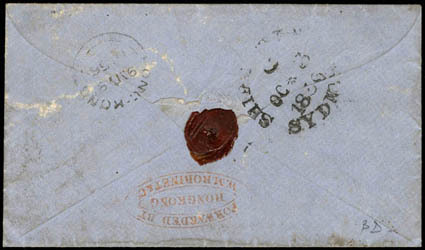 New South Wales, 1841-44 New South Wales Overland and Inland Rate Covers, 5 covers; with 1841 Berunia to Sydney with manuscript "8" rate, 1842 Windsor to Sydney with "7" rate (for 30-50 miles), 1843 Melbourne to Sydney with overland "1/3" rating and 1843 Sydney to Melbourne with similar rate, generally F.-V.F. or better. 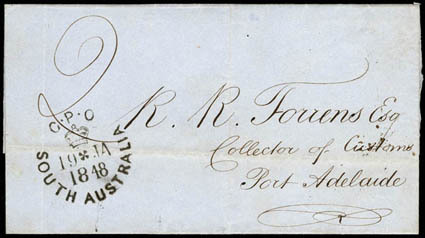 New South Wales, 1844-54 New South Wales Ship Letter & Inland Rate Covers, four covers; 1844 London to Sydney with manuscript "1/-" packet and "7" intracolonial ship letter rate, 1849 Liverpool to Gelong with "1/2" for the double 8d rate, 1850 Blackheath, England to Hunters Rivers mourning cover with manuscript "5" for 3d ship plus 2d overland, and 1854 Liverpool to Albany with large numeral "5" handstamp, generally F.-V.F. or better. 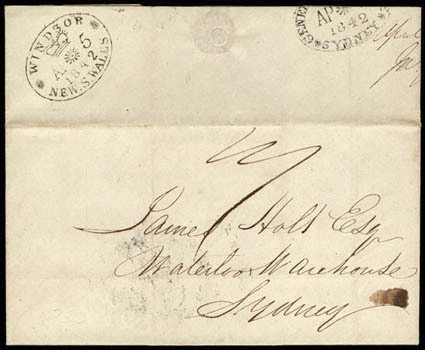 New South Wales, 1833-56 New South Wales Ship Letter Covers, 5 covers to Sydney showing either "3" ship letter or "4" single letter rate (pre-1835 Act); with 1833 & 1835 from Liverpool, 1852 London prepaid "8d", 1854 Melbourne via Lady Joselyn, and 1856 cover from Hong Kong with Robinet & Co. forwarder handstamp on reverse, generally F.-V.F. or better. 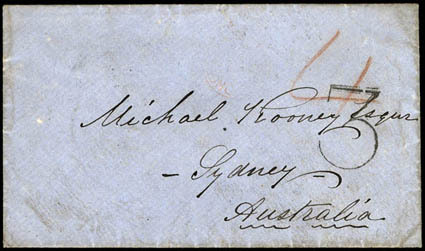 South Australia, 1840-89 South Australia Stampless Due Covers, 5 covers; with 1849 Adelaide to "Evandale V.D.L." 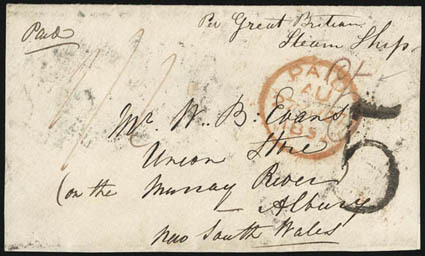 via Hobart with origin handstamp and manuscript "7" rate for ship letter and overland rate combination, 1844 England to Adelaide with manuscript "8" double ship rate, 1846 Hobart to Adelaide with manuscript "6" ship letter rate, 1848 Adelaide local rate with manuscript "2" rating, and 1889 Mintaro Central Railway to Adelaide with large "4" handstamp, generally F.-V.F.